Love the canals of London? Then you’ll love HotTug UK. Then this new HotTug type boat that originally came from Denmark has it all. The HotTug was originally designed by Frank de Bruijn. With the HotTTug boat being so close and down in the water it makes you literally feel at one with the surroundings according to Frank. There is 1800 litres in the HotTug and is kept hot at 38 degrees Celsius 100 degrees F) via a underwater wood burning stove. The HotTug is constructed from wood and fitted with glass-fibre reinforced polyester. The stove is made of stainless steel and has a double-walled pipe. The HotTug is powered by a built-in electric motor making it very quiet and reaching a speed of 3 mph. This is most certainly the most unique 90 minute experience (75 minutes on the water) that you can ever have in London whilst sailing the London waters within a swim costume whilst having fun with friends (holds 7 people) and drinking drink within a limit of course and the driver has to remain sober. See video below for our time in the HotTug when we sailed the canals from Angel. 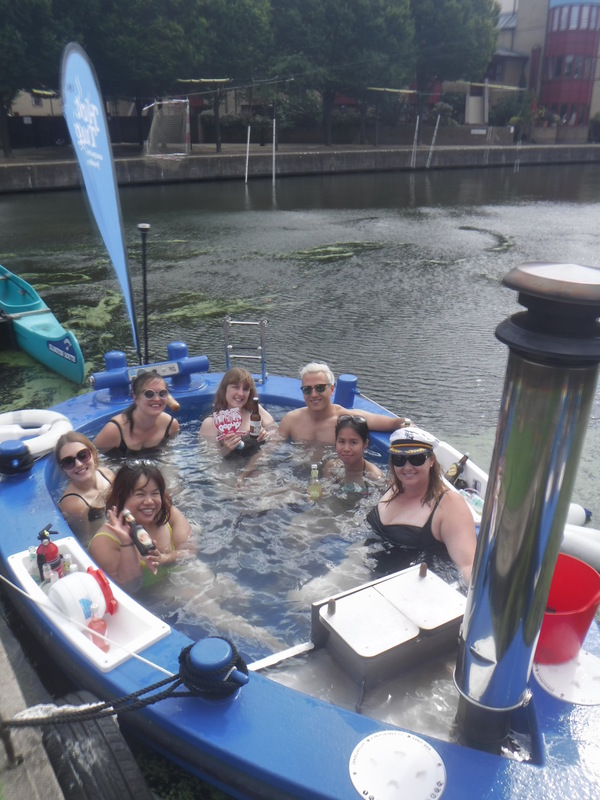 See video below for our time in the HotTug when we sailed the waters of Canary Wharf. To book a time slot for HotTug UK click here. Thanks to HotTug who let some of the community of Love Pop Ups London come down to experience both locations. Read all blogs/reviews from the comments section below. Saturday morning, with friends, fentimans and a hot tub, want to know more? If someone had told me that I would be sailing in a hot tub on London’s canal, drinking Gin & Tonic, I would have rolled my eyes and thought that it was too early to dream. But this dream came true for the seven of us from the LovePopUps London community. Praying hard for the English summer weather not to rain on us, we dressed in our swimwear one early Saturday morning to set sail with Fentimans on board. I am often amazed at how infrequently the canals of London (e.g. Regents and Islington) are visited by the London locals and on discovering them myself only a few years ago I LOVE to take visiting friends on walks down them. The barges are beautiful and the views stunning on a sunny day. I have always fancied the canal rides however never managed to go. Sooooo on hearing about a tug fill with lovely warm water, pootling up and down Islington canal I couldn’t miss the chance. It was an unreal start to the morning, in beautiful warm clean water, heated by a lovely smelling wood burning stove which keeps it warm for the 90 minute journey. Sunk so low in the water that it feels like water will pour over the sides (it doesn’t) and like you could touch the swans and geese swimming past (don’t). We were also able to try some of Fentimans lovely new alcoholic drinks (a particular favourite was the Bloom Gin and rose lemonade) however there must be a designated driver who remains sober (and gets to wear a captain hat!). Originally invented in Rotterdam, Tommo and Jack have recently brought it to London’s canal routes and at only 4 weeks old HotTug in London is doing well with over 50 successful trips up and down the canal. The route is short but it is perfect for moseying along (max 3mph, powered by an electric motor) with drinks, catching up with friends. Currently situated at the Islington boat house there are 2 Hot Tugs available to hire at a pricey £200 for 90 minutes. There are facilities to shower and change however these are fairly basic. Although it sounds quite expensive it fits up to 7 people and is the perfect celebration outing for birthdays etc. A huge thank you to Love London Pop Ups, for inviting me, and Tommo for his welcoming, friendly self – a huge congrats for bringing such a unique experience to London, I wish them every success. Who doesn’t love sitting in a hot tub having a few drinks with good friends? Hot Tug allows you to do that, but all the while driving down the canals near Angel station. I had so much fun cruising down the canals in a Hot Tub. That’s right this is one not to be missed, with water heated to 38 degrees you can float down the canal in your swim suit. Part Jacuzzi, part boat. What more can you ask for! I really enjoyed the experience of sitting back and watching the world go by. I found it very calming on the water and would love to go again. What an incredibly quirky evening, I can’t recommend enough! I was invited back to latest Hot Tug location at Canary Wharf.